Colorado State coach Jim McElwain has emerged as a leading candidate for the Florida vacancy, multiple sources told Yahoo Sports Sunday. McElwain and Florida athletic director Jeremy Foley discussed the Gators job Saturday night, sources said. Information has been gathered on McElwain by Florida officials since the school announced two weeks ago that Will Muschamp would not return as coach, sources said. It is unclear how many other candidates may be involved. Sources said Mississippi coach Hugh Freeze was among those on Florida athletic director Jeremy Foley's radar, but McElwain's name may be at the top of the list. 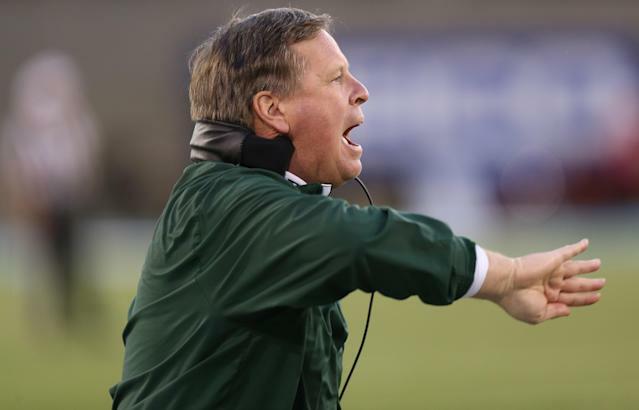 The 52-year-old McElwain is finishing his third season at the Mountain West Conference school. The Rams are 10-2 this year and were one of the strong possibilities for a major bowl bid from the "group of five" conferences outside the Power Five until being upset by rival Air Force on a field goal on the final play Saturday. Colorado State has taken a step up in each of McElwain's years there. He took over a program that had gone 3-9 for three straight seasons from 2009-11 and has gone 4-8, 8-6 with a victory in the New Mexico Bowl, and now a 10-2 season that includes victories over rival Colorado and Boston College. The only other loss outside of Air Force was in September to Boise State. McElwain's team features the No. 2 quarterback in the nation in pass efficiency in Garrett Grayson, who has thrown for nearly 3,800 yards, 32 touchdowns and six interceptions this season. The Rams also have the nation's leader in receiving yardage per game (149.1) and touchdowns (17) in Rashard Higgins. McElwain has Southeastern Conference experience. He is a former Nick Saban assistant coach at Alabama, working as offensive coordinator and receivers coach from 2008-11 when the Crimson Tide won two national titles. McElwain has a reported $7.5 million buyout, according to the Denver Post.